Baldor’s new Definite Purpose Commercial Motor line offers many new ratings designed for applications with low to medium starting torque requirements. The Baldor Commercial Duty Motor line brings Baldor’s reputation for high quality designs to commercial applications with a cost-effective offering. This definite purpose product line is designed for certain applications requiring NEMA 48 and 56 motors rated between 1/4 and 1 HP, in both single and three phase ratings. Typical applications include: Jet Pump, Heating and Cooling, Ventilation, Air Conditioning, Blowers, Direct Drive Fans, Condenser Fans, and Pedestal Fans. Baldor’s extensive line of General Purpose motors are available in Open Drip-proof and TEFC construction in both single and three phase. Horsepower sizes available from stock range from 1/12 HP through 1500 HP. 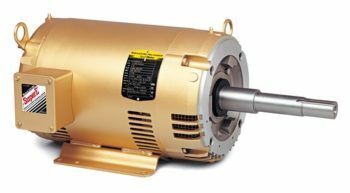 Designed for “general purpose” use means that these motors can be used in applications which include compressors, pumps, fans, conveyors, material handling, machine tools and many others. Also available are stock motors that are direct replacements for the motors built in Pre-1952 NEMA frames.